A new study has found that fathers give their children more leeway and allow them to more actively explore their environments. Researchers in Montreal placed kids aged 12 to 18 months (accompanied by a parent) in three different risky situations including a social risk where a strange adult entered his or her environment, a physical risk where toys were placed at the top of a stairway, and a forbidden activity where parents were forbidden to climb the stairs after the child succeeded the first time. "We found fathers are more inclined than mothers to activate exploratory behavior by being less protective," said the study’s lead author, Dr. Daniel Paquette. "The less the parent is protective, the more activated is the exploratory behavior in the child." Experts say parents need to work to find the correct distance away from their children to encourage exploration without jeopardizing their safety. About an arm’s length is perfect, according to Dr. Paquette. 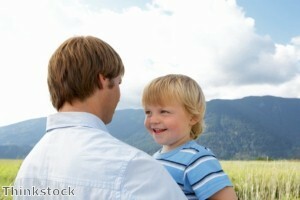 In addition, fathers should take cues from their children. For instance, more risk averse kids may need more help from their parents to explore their surroundings. "By stimulating exploration, controlled risk-taking and competition, fathers provide something different to the child who will benefit greatly from this singular contribution," said Dr. Paquette.